Bruce Lee, vice-president of Handset Business of Huawei Consumer Business Group, and Stefan Kischka, president wireless/Internet of Things, TUV Rheinland, attend the awarding ceremony. 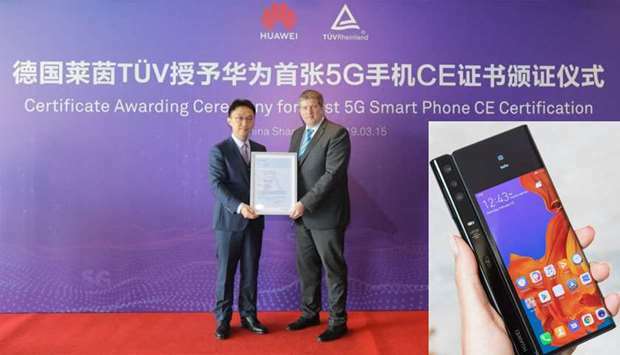 Huawei Mate X has received the world’s first 5G CE certificate awarded by TÜV Rheinland, a global leader in independent inspection services, which indicates the smartphone has smoothly passed the rigorous test and evaluation and become the world’s first 5G smartphone approved by the Notify Body of the European Union. Bruce Lee, vice president of Handset Business of Huawei Consumer Business Group, said: “Compared with the previous generation of communication technology and products, 5G technology and product forms are more complex. 5G certification testing standards and equipment still rely on continuous improvement. It is an unprecedented challenge to evaluate 5G smartphones. TÜV Rheinland wireless/Internet of Things president Stefan Kischka said, “I’m glad that TÜV Rheinland has witnessed Huawei’s global 5G technological strength, which is exciting news for both industry and consumers. As Huawei's first 5G smartphone, Huawei Mate X is equipped with Huawei's most sophisticated technology and patents. The Huawei Mate X runs on the Balong 5000 chipset, which is the world’s first multi-mode 5G SoC with 7nm process, being able to support 2G, 3G, 4G, and 5G with a single chip. Balong 5000 is the first to achieve the industry’s benchmark in 5G peak download rate, offering 4.6Gbps in Sub-6GHz (low frequency band, 5G main frequency band). Balong 5000 is the world’s first chipset to support SA and NSA simultaneously, with the ability to adapt to different hardware requirements and formats for users and telecom operators, making the Huawei Mate X the true 5G smartphone. In addition, Huawei integrates four sets of 5G antennas with many cutting-edge technologies in the thin folding body of Huawei Mate X. 5G signal transmission is smooth, strong and stable, and is completely ready for embracing the challenge of mass data transmission in 5G era. The acquisition of the world's first 5G CE certificate for the smartphone has laid a solid foundation for the large-scale commercial use of 5G mobile phones in the future, and once again highlighted the leadership position of Huawei on 5G. Huawei will continue to actively promote the mature development of 5G industry and provide consumers with real 5G experience and services.